Amid the controversy over its 737 MAX aircraft, Boeing unveiled the 777X in an employee-only preview rather than a public event. 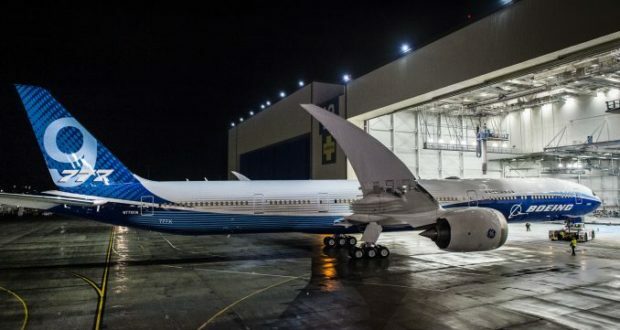 In the midst of the ongoing controversy surrounding the grounding of its fleet of 737 MAX 8s worldwide, Boeing has quietly unveiled its newest aircraft type, the 777X, billed as the world’s longest passenger plane. The employee-only preview, at Boeing’s manufacturing facility near Seattle, was delayed for several days and kept low-key out of respect to the victims of the Ethiopian Airlines disaster. Plans for a highly public display were put on hold. The 77-metre-long 777X has a wingspan of 72 metres and a range in excess of 14,000 kilometres. Of the two models the biggest is the 777-9X, with three extra rows of seating and able to carry up to 425 passengers. The second model, the 777-8X, can seat between 350 and 375 passengers and fly more than 16,000 kilometres, making it a challenger to Airbus’ ultra-long-range A350. The secret of the performance comes from the wide super-aerodynamic wings, made of carbon-composite materials and able to bend while in the air. The long wings have a folding mechanism enabling them to squeeze more easily into airports, keeping in line with taxiway and gate size restrictions. On the fuselage at the preview event were the tails of each of the aircraft’s launch customers, including ANA, British Airways, Cathay Pacific, Emirates, Etihad, Lufthansa, Qatar Airways and Singapore Airlines. The 777X has been designed to replace the 777-300ER, which has been a part of the fleet for a number of long-haul carriers. General Electric’s largest ever engine, the GE9X, is the driving force for the 777X, created exclusively for the new aircraft type. It is part of a wider trend of engines being created specifically for new models of aircraft.